Merchants are well-rounded in terms of physical prowess, able to match a soldier in terms of attack power and defense so long as their Credit holds up. Magically, a merchant can weather multi-target damage fairly well in spite of poor intelligence growth if built for it, but single-target damage will still be a notable concern. 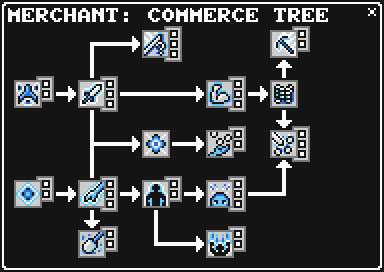 Merchants are among the best classes when it comes to grinding due to being able to easily accumulate bonuses to gold find and item find, as well as the ability to bank items from anywhere. Overall, merchants can fit in with most any party and hold their own. Merchants can equip Swords, Abaci and Daggers. They use Medium to Heavy Armor. In their offhand slot, Merchants equip coin bags which offer defense and stat boosts. The merchant does not have mana in the normal sense. Instead they use a system called Credit to activate their abilities. 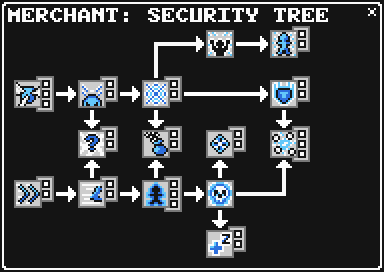 A Merchant has a maximum of 600 credits and gains these credits by either attacking or being attacked. Diverse Portfolio - - 2 +1 to Plus Fire, Ice and Storm for every 4 levels. Enchanter 5 Diverse Portfolio (2) 3 +30% to the Power of all Weapon Enchants. Pickpocket 5 Lucky (2) 3 +10% to the Rate of Pilfer. Gold Digger 5 Pickpocket (3) 2 +1 to Plus Gold and Plus Exp for every 3 levels. Confounding Blows 10 Enchanter (2) 3 +5% chance to inflict Confuse with all physical attacks. Tax 10 Enchanter (1) or Pickpocket (1) 1 Inflicts direct damage that is returned as HP to the caster. Poise 10 Pickpocket (2) 2 +25% chance to ignore the effects of Confuse. Might 15 Enchanter (2) 3 +1 to Strength for every 3 levels. Collections 15 Ability: Tax (1) 2 +15% to the Power of Tax. Finance Major 15 Poise (2) 3 +5% to the Rate of Economy. Crazy Powerful 15 Poise (2) 2 +25% to physical damage when Confused. Prospector 25 Ability: GoldRush (1) 2 +10% to the Power of GoldRush. GoldRush 25 Might (2) 1 Inflicts direct damage. Interest 25 Ability: Goldrush (1) or Finance Major (1) 3 +10 to Credit earned from inflicting damage. Mitigate - - 3 -8% to damage taken from all multi-target abilities and attacks. Dexterous - - 2 +1 to Agility for every 3 levels. Shrewd 5 Mitigate (2) 2 +1 to Intelligence for every 3 levels. The Happenings 5 Shrewd (1) or Sidestep (1) 2 +3% chance for bizarre helpful events to occur each round in battle. Sidestep 5 Dexterous (2) 2 +2% to Bonus Dodge. Regulator 10 Shrewd (2) 2 +1 to Fire, Ice and Storm Resist for every 4 levels. Savings 10 Regulator (2) or Stamina (2) 2 +100 to Max Credit. Stamina 10 Sidestep (2) 3 +1 to Max HP for every 2 levels. Distract 15 Regulator (1) 1 Causes attacking foes to focus on the caster; lasts one round. Solvency 15 Ability: Bankrupt (1) 2 +10% chance to avoid being Stunned after using Bankrupt. Bankrupt 15 Stamina (2) 1 Prevents caster from being KOed for one round; Stuns caster. Nap Time 15 Ability: Bankrupt (1) 2 +15% of Max HP healed each round in battle when Asleep or Stunned. Hunker Down 25 Ability: Distract (1) 2 -10% to all damage received when using Distract. Protected Assets 25 Regulator (2) 2 +1 to Defense for every 3 levels. Bigger Returns 25 Protected Assets (2) or Ability: Bankrupt (1) 3 +10 to Credit earned from taking damage. Coinflip 75 1 34% base chance to instantly kill a single target. Against players/bosses a successful Coinflip does damage between that of a normal attack and a critical hit. Pilfer 200 3 35% base chance to steal an item from the target's inventory. Guard 0 7 Boost target's Defense and redirects targeted attacks to the caster. Trade 175 10 The caster and a single target swap their current status effects. Loan Gold 12 For every one gold spent the merchant will gain two credits. Economy 150 15 35% base chance to Confuse each member of an enemy group. Appraise 75 18 Examines enemy stats in battle and reveals the contents of chests in the overworld. Deflate 100 25 Burns a small amount of MP, Will, Rage, or Credit from a single target. Vault 600 30 Allows all allies to deposit items into the vault in the overworld. Tax 100 10 Steals HP from a single target. GoldRush 275 25 Inflicts direct damage on an enemy group. Distract 300 15 Causes attacking foes to focus on the caster for one round. Bankrupt 450 15 Prevents the caster from being KOed for one round then Stuns the caster.